Flavorful, chunky tomato sauce served over a bed of spaghetti squash. Healthy, full of veggies, vegan, low carb, and delicious! I hesitated on whether to post this recipe to my blog. It’s not authentic Italian, it’s not inspired by any amazing restaurant dish, it isn’t made from scratch, and it isn’t especially clever. It’s just simple, healthy, and full of veggies. And it’s a dish that I make at least once a month. So now you know that I don’t always eat restaurant-inspired, richly-flavored dishes for dinner, sometimes I just crave a big plate of healthy, hearty food. 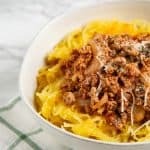 Cook the spaghetti squash in the Instant Pot or microwave. While the spaghetti squash is cooking, mince the garlic, dice the onion, and slice the mushrooms. Heat a large nonstick skillet over medium heat. Add the onion and garlic and cook for about 6 minutes. The add in the mushrooms and cook for another 6 minutes. Add in the marinara sauce and meatless crumbles and cook until heated through. Then add in the basil and salt to taste. When the spaghetti squash is done, cut in half, scoop out the seeds, and fluff up using a fork. Sprinkle the spaghetti squash lightly with salt, then serve with the spaghetti squash. You can substitute whatever veggies you have on hand. Over the summer when I have fresh vegetables from my garden, I’ll use cubed eggplant or sliced zucchini in place of the mushrooms. Serve with spaghetti squash in place of pasta, or just use regular spaghetti if you prefer. You could also use ground beef or ground turkey in place of the meatless crumbles. Just cook the meat before starting on the veggies and set aside, then incorporate with the marinara sauce at the end. Looking for more vegetarian dinner recipes? Try this Lemon Ricotta Pasta, Vegetarian White Bean Chili, or Instant Pot Enchilada Rice. 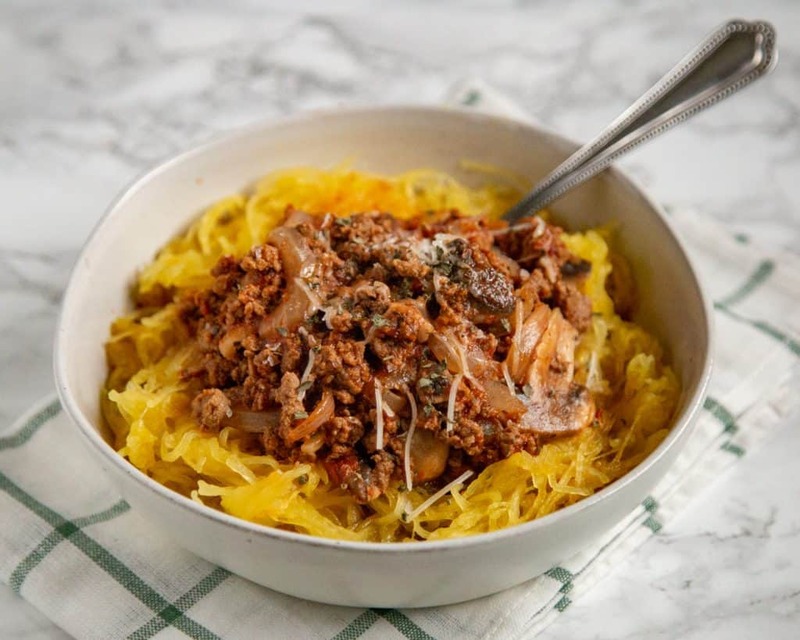 If you try this recipe for Spaghetti Squash Spaghetti, leave a comment and review below and let me know how it worked out for you! 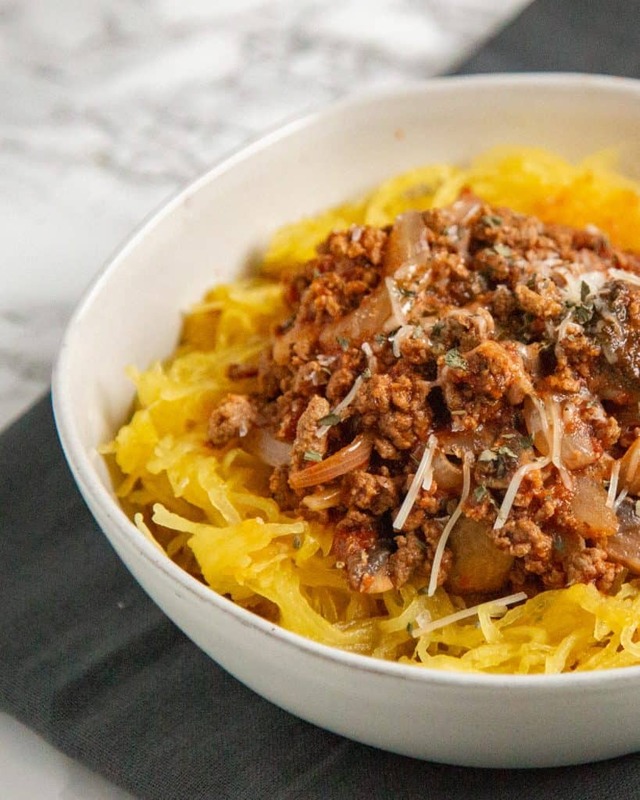 Cook the spaghetti squash in the Instant Pot or microwave using your favorite cooking method. While the spaghetti squash is cooking, mince the garlic, dice the onion, and slice the mushrooms. Heat a large nonstick skillet over medium heat. Add the onion and garlic and cook for about 6 minutes. The add in the mushrooms and cook for another 6 minutes. Add in the marinara sauce and meatless crumbles and cook until heated through. Then add in the basil and salt to taste. When the spaghetti squash is done, cut in half, scoop out the seeds, and fluff up using a fork. Sprinkle the spaghetti squash lightly with salt, then serve with the spaghetti sauce.